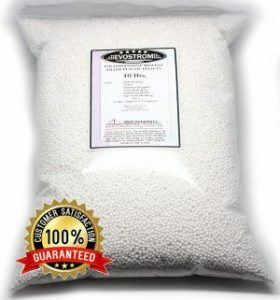 Polypropylene plastic pellets are not the unanimous choice for large sized bean bags because of the weight. But they make the perfect filler for kiddie bags, weighted blankets and corn hole sized bean bags. This is a 5 lbs. pack of heavy polypropylene plastic pellets manufactured by Evostorm, in the United States. Each pellet is uniform sized (0.125 of an inch) and makes for an excellent high density fill material. There is no odor or pigments used in the pellets and you can easily use these for arts and crafts projects. More importantly, these are completely non-toxic and can be washed and dried after use. The pack of pellets comes in a convenient, heat-sealed bag that also doubles up as a storage for any leftover pellets that you may have. All said and done, there is no reason why you cannot use these for refilling your bean bag. It would probably be a very heavy bean bag that you cannot move around home that easily. But if you are willing to live with that, then these pellets are pretty comfortable to sit on. Also, they don’t flatten that easily. Eventually, it boils down to your personal preferences. Not the best option for large bean bags because of the extra weight that this will add to the bean bag. If you are shopping for good quality polypropylene plastic pellets for arts and crafts, small bean bags or for corn hole bags, then look no further. The Evostorm Plastic Pellets are your best bet. They are reasonably priced, reusable and have an excellent customer rating. Can’t ask for more.